One of the few overnight boats with scuba diving - an unforgettable experience! Fun tour on an authentic sailing boat that will offer a unique experience and a party on the water! New Horizon is the ideal trip for those with a sense of fun and a craving for adventure! Being one of the most popular tours on the East Coast of Australia, backpackers travel from all corners of the globe just to take part in this once-in-a-lifetime Whitsunday adventure that will have you laughing, exploring and making memories to last a lifetime! Snorkel or dive amazing coral reefs, take an exhilarating ride on a jet boat, 'walk the plank', zip down a mega slide, or paddleboard around secluded bays - New Horizon has it all! This is just the start of the activities you can get your hand on while sailing the Whitsundays on New Horizon! The best part about this tour is the flexibility to do your trip, your way. While there are plenty of action-packed activities you are also welcome to relax on the deck and soak up the sun, or lounge on beanbags in the air-conditioned movie room. New Horizon is also available for Private Charter. Our stunningly famous beach is often referred to as one of the world's Top Ten Beaches, confirmed by Trip Advisor and Lonely Planet. The stark white sands and cool blue backdrop provide the perfect photo opportunity, making it the perfect place to snap some photos so you can walk away with some great images to share with the world !Thousands of visitors come to the Whitsundays every year just to see it for themselves and enjoy its unique beauty and stunning surroundings. Its pure white silica sand is actually said to have come all the way from Antarctica, or is even the result of ancient volcanic activity. Its very fine nature means the sand is millions of years old and makes for the perfect place to relax, play beach games or explore. It squeaks between your toes as you walk around and doesn't get hot like normal sand due to its composition and colour, making it some of the most unique sand in the world. Come experience Whitehaven Beach on board New Horizon and see it for yourself - we know you won't be disappointed! Explore some of the best reefs in the world, where you can snorkel and swim with the fish around the fringing coral reefs of the Whitsunday Islands. Immerse yourself into the underwater world, where you can see tropical fish, green sea turtles, colourful corals and more! Bring your GoPro along and be amazed by the clarity and colour below the surface, getting some footage and photos along the way. Snorkelling is included in the trip with several snorkelling opportunities on the itinerary. 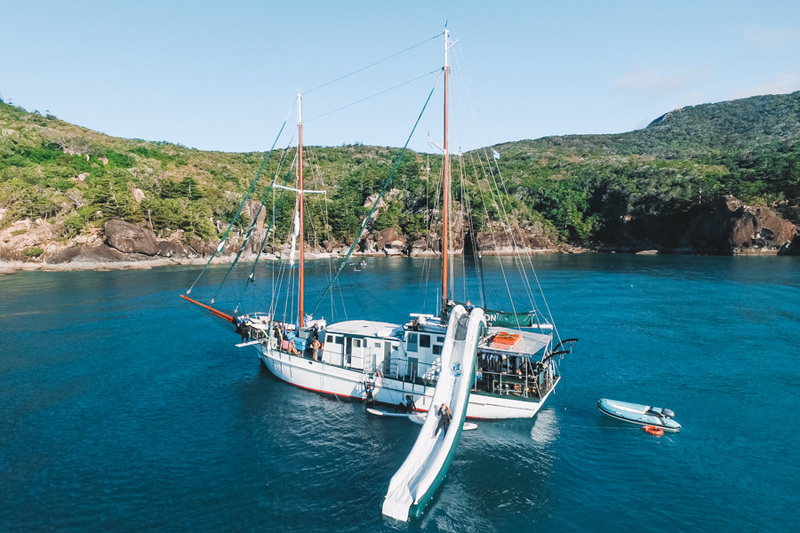 It is a must-do activity while sailing around the islands and offers one of the best ways to experience the fringing reefs of the Great Barrier Reef Marine Park. From the surface of the water you can see the reef fish and corals up close, enjoying it in all its beauty. However, if you would like to dive further beneath the waves, New Horizon also offers passengers the wonderful opportunity to scuba dive! This is available for both certified divers and intro divers - Scuba dives are $65pp (maximum 1 dive per person). The price includes all gear hire and dive instructor. Please note intro divers are subject to age, conditions and medical questions and certified divers need to bring their dive certificate. All diving is subject to availability, MUST be pre-booked, and is paid for on board. Watersports - Mega slide, stand-up paddleboards, jet boat rides and MORE! Stand-up paddleboarding is a great way to have some fun on the reef while you're at anchor! This challenging and fun activity is a great excuse to spend some time on the water, making your way around the reefs. Hop on and cruise around the reef seeing it from a new point of view, trying your hand at this fun sport! This fun activity is the newest and funnest way to experience the calm waters of the Coral Sea while on board New Horizon. You can also get the adrenaline pumping by zipping down the mega inflatable slide, or test your inner pirate by daring yourself to 'walk the plank' before diving into the warm water below! New Horizon has recently partnered with Pioneer Jet to offer guests two new water sport activities to try out: jet boat and banana boat rides! These wild ride are available on Day 3 of the tour where you will be able to go fora fast zip around the Whitsunday waters! 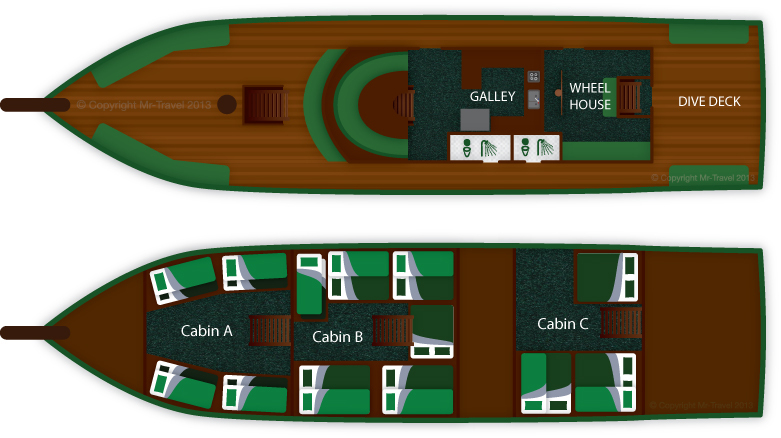 These activities do not need to be pre-booked, and are payable on board the vessel. Breakfast: Tea and coffee, a selection of breads, spreads such as honey, jam marmalade, Vegemite and peanut butter. Tropical fresh fruit platters as well as toasted muesli and cornflakes. *Please note this is a sample menu and is subject to change and amendments. With prior arrangement, most special diets can be catered for. Please only bring a small soft overnight bag without any zippers (ie. a re-usable shopping). A zipless souvenir bag can be purchased at the boat's check-in office for a few dollars. Ensure you pack clothes, a hat, swim-wear, beach towel, sunscreen 30+, warm pullover for the evenings (seasonal) and cash/card for on board purchases. Feel free to bring on board a reusable water bottle and/or additional snacks. You will also need to bring your own alcoholic beverages, available for purchase in town. No glass bottles please. BYO alcohol (no glass) and scuba diving. Soft drinks, chips and chocolate available for purchase on board. New Horizon offers onboard scuba diving for both certified divers and those without experience/qualification. Scuba dives MUST be pre-booked, but are paid for on board. "Had an amazing trip with New Horizon. The crew was very helpful and friendly, the food was great and we saw the most beautiful spots from the Whitsundays." "Had an amazing time on new horizon! Food was tasty and there was plenty of it! All staff were fun and informative (conor, Nicko & Eileen) and made sure we had the best time. Definitely recommend this boat for a Whitsundays tour!" "As if the East Coast couldn't get any better, being on the New Horizon was one of the best experiences so far. The Crew (Crossy, Conor and Nick) were fab and made the trip amazing. Everyone was lovely on board #TeamNewHorizon"
"Great couple days on the boat the crew were amazing Crossy got us everywhere and was smooth sailing, Conor was good fun and full of great information about the islands and nick was great fun always having a laugh and the food was great! (Found my husband #foundMrWright)"
"Absolutely amazing trip, loved every minute of it from the diving board and the slide to the snorkelling and seeing the beautiful coral and of course the visit to the gorgeous Whitehaven beach. The guys Nick, Conor and Crossy made the trip 100 times Better by keeping us safe, making the best meals and just being great guys !! Thanks for showing us around the Whitsundays and giving us the time of our lives!" "This was a-ma-zing! New Horizon is such a beautiful boat and we had a lot of fun! The food was delicious because Nick made it, even tho the skipper #Eileenwasbetter! In the welcome speech Conor and Tommy said they donâ€™t do a lot on the boat, but it kind of surprised us how much they actually do! Couldnâ€™t have had a better experience!! Thanks guys!" "Amazing trip. It's a very nice boat, everything was good organized, the crew (Nick, Eileen, Tommy, Conor) was very cool and entertaining. Storytime was fun :D We visited nice spots, equipment and activities were sweet. Really enjoyed the stand up paddle board!" "Had such a great time on the trip! I have always wanted to go on a sailboat and this was a great way to be introduced to it. The stops at Whitehaven Beach, the reef snorkels, and the last morning of water sports was really great. I had so much fun sitting on the bow riding some of the bigger swells. The food was great too! The crew was very funny and nice too. Definitely recommend this tour! Crew: Ilene, Connor, Tommy, Nick"
"This trip was absolutely great. The staff was wonderful and the atmosphere awesome. It was clean and the food delicious. Whitsunday Islands is paradise!" "I did the two night /day sailing trip with the New horizon Boat. This was one of the best trips I've done to date! The food was fantastic! And on the boat the crew were excellent . Whitsundays has to be one of the most beautiful places I've seen to date, words can't describe it!. I would advise anyone to put this on your bucket list! This two day trip was well planned with more than adequate time for snorkelling at some of the most beautiful spots in Australia. I would highly recommend this trip and would do it again!" "I went on New Horizon it was a great experience!! Definitely a must do in the Whitsundays! The crew are so much fun and there was great company! Loved the food yummy fish! there were even paddle board on the boat which is loved :) Thanks New Horizon!" "This was my favourite trip up the East Coast. Our crew were awesome and made the trip just that much better." "Had an absolute blast. Best thing to do on the east coast by far. The crew are amazing so much fun... They really try to make your trip amazing best time of my life "
"Amazing from start to finish. Great food, great crew, would recommend to all! " "Great food, great crew, great activities! Awesome trip especially the diving! Nice laid back attitude for us to enjoy the trip. Loved paddle-boarding in the sunset! Thanks New Horizon!"